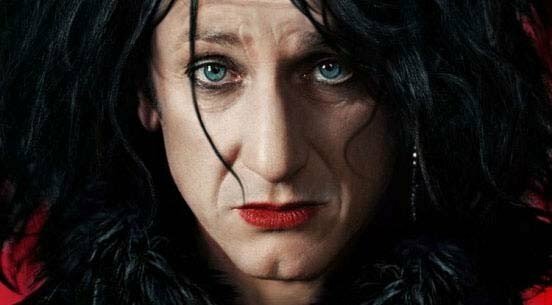 Sean Penn goes the Robert Smith route in This Must Be the Place. Sean Penn (Milk), Frances McDormand (Fargo) and Judd Hirsh (A Beautiful Mind) star in the 2011 comedy-drama film This Must Be the Place. Written and directed by Italian filmmaker Paolo Sorrentino (Il Divo), This Must Be the Place received the Prize of the Ecumenical Jury at the 2011 Cannes Film Festival, where it was also nominated for a Palm d’Or Cannes. It made it’s U.S. debut at the 2012 Sundance Film Festival before its limited rollout to Stateside theaters in November, 2012, where it rang up $142,000. As for the critics, the R-rated film earned a fair 6.2/10 rating at Rotten Tomatoes based on 79 published reviews. This Must Be the Place looks like its worth catching, at the very least to check out Penn sporting black clothes, dark eyeliner, bright red lipstick and a shaggy goth-styled hair-do. Oh, the movie takes its title from the same-named 1983 Talking Heads song written by David Byrne, who pops up in the movie portraying himself. No bonus features are on the DVD or Blu-ray.